Momiji Residence is located at 3555 Kingston Road, just south of the intersection of Markham Road and Eglinton Avenue in southeast Scarborough. Since opening in 1992, Momiji has been home to close to 400 tenants who have remained independent an average of 10 years longer than any other supportive housing facility in Ontario. This is significant given the strained availability of long-term care home beds and the financial challenges of our health care system. The building itself is 169,682 sq. ft. and sits on 2.3 acres of property that includes exterior and underground parking and gardens. The residence was constructed by the Government of Ontario, and its operations and building maintenance are funded by the Ministry of Health and Long-Term Care. Momiji Residence is a unique, non-profit apartment complex offering the security and privacy of a home with the convenience and services of community living. 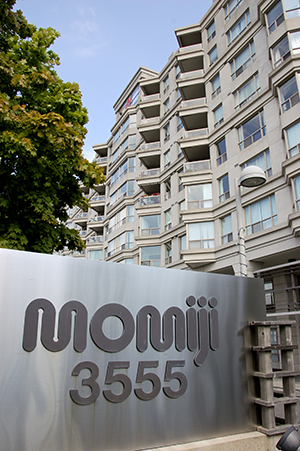 Momiji offers 133 self-contained apartments in a Japanese-inspired design, 23 of which are wheelchair accessible. The building consists of seven floors of apartments and two floors of amenities reserved for programs and services that enhance the life of seniors living onsite and in the community. You or your spouse must be at least 60 years of age and require support services. You must be a Canadian citizen, landed Immigrant or refugee claimant. Rent-geared-to-income applicants must be a permanent resident of Ontario at the time the housing offer is made. Momiji Health Care Society is a dedicated Support Services facility for elderly people. Accordingly tenant selection is based primarily on the applicant’s need for support services and personal assistance, such as bathing, cleaning and cooking. In compliance with the Ministry of Health’s requirements, applicants are placed on a waiting list and admitted to Momiji by a modified chronological selection system. The first qualified applicant requiring support services will be selected. All applicants are encouraged to inform Momiji of relevant changes in their support requirements. On average, Momiji has 10 vacancies per year. 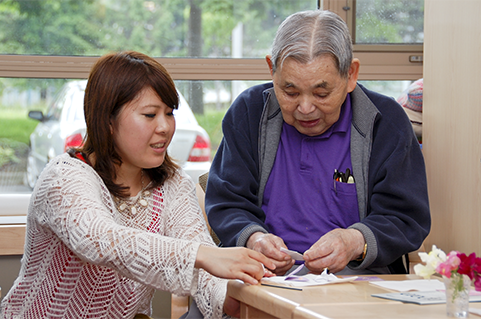 More than 60% of Momiji units are offered to seniors who qualify for rent-geared-to-income assistance. In order to qualify for this subsidy, applicants must meet criteria established by the Ministry of Housing and the Ministry of Health. For more information, please contact Momiji’s Client Intervention Worker at 416.261.6683 x249. If you need assistance completing the application or have questions, contact Momiji’s Client Intervention Worker at 416-261-6683 x 249. You can also apply to Toronto Social Housing Connection at 416-392-6111. To contact our Director of Senior Residence call 416-261-6683 ext 222.